Published in At War with Civil Rights and Liberties, Thomas E. Baker, John F. Stack, Jr., Rowman & Littlefield, 2005. A constitutional issue recently addressed by the United States Court of Appeals for the Second Circuit in United States v. Awadallah, 349 F.3d 42 (2003), has not received the widespread attention of high-profile litigation concerning the Justice Department's other controversial counter-terrorism policies. It is equally important. 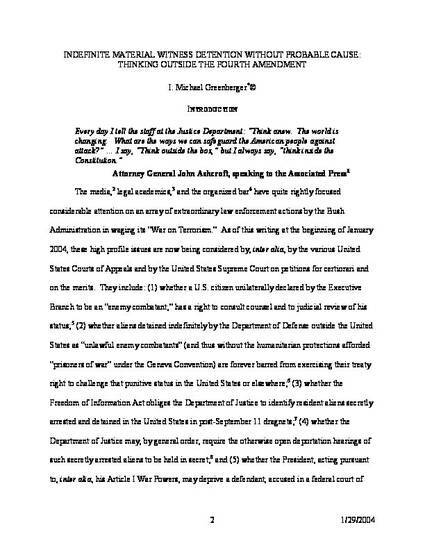 The issue arises out of Attorney General Ashcroft's announcement shortly after the terrorist attacks of September 11, 2001 that the aggressive detention of material witnesses [was] vital to preventing, disrupting or delaying new attacks. Since that time, the Department of Justice has used the federal material witness statute (18 U.S.C. Section 3144) to arrest numerous individuals and detain them indefinitely in the general prison population for the ostensible purpose of securing future grand jury testimony. While held pursuant to the statute, they are not charged with any crime; nor, upon their detention, is there any probable cause that they have committed a crime. This Article contains a historical survey of the federal material witness statute, as well as relevant Federal Rules of Criminal Procedure, legislative history, and case law. In particular, this Article highlights a sophisticated federal district court analysis of this issue, the logic of which attempted to accommodate the interests of all the parties involved in terrorism investigations. The judge in that case suggested a process in which the Government could obtain the grand jury testimony of a material witness, while minimizing the intrusion on the material witness' liberty interests by affording them their freedom via bail or a deposition. The Second Circuit declined to follow this approach in practice by sustaining the Fourth Amendment validity of the Department of Justice's indefinite detentions of grand jury material witnesses without bail or a deposition. As presently drafted, and as construed by the Second Circuit, the federal material witness statute is ambiguous and subject to conflicting interpretation. At the same time, the statute also raises serious constitutional questions. This Article suggests a legislative remedy which accommodates the Government's need to secure important grand jury testimony, while avoiding what amounts to unjustifiable, coercive, and indefinite material witness detentions pending grand jury investigations.